With this clear acrylic tray you can be sure that your products will look their best while also being protected. A hinged door allows for easy access by authorized personnel while a locking mechanism prevents any unwanted access. Constructed of only the highest quality acrylic materials durability is a major strong point. This makes these acrylic trays perfect for fast paced retail environments. The clear design also allows customers to view the product from all angles easily. 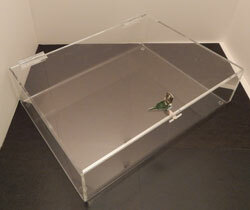 This acrylic tray has two acrylic hinges and a locking lid. Allows shoppers to view your merchandise completely while maintaining security. Available in 2 Sizes.